Denitrification is removal of Nitrates from water or waste water. There are two basic approaches for Denitrification. Nitrate is a stable and highly soluble ion with a low potential for precipitation or adsorption. These properties make it difficult to remove from water using treatment processes such as filtration or activated carbon adsorption. As a result, more complex treatment processes must be considered. For waste water streams biological treatment is suitable which combines with BOD removal. For potable water systems processes such as ion exchange, reverse osmosis, and electrodialysis or Engineered Biological Treatment systems are employed depending upon Nitrate content & System Flow. These processes physically/chemically or biologically remove nitrate from drinking water. Untreated domestic wastewater contains ammonia. Nitrification is a biological process that converts ammonia to nitrite and then to nitrate. If standards require that the resulting nitrate be removed, one treatment alternative is the process of denitrification, in which nitrate is reduced to nitrogen gas. Nitrification is a microbial process by which ammonia is sequentially oxidized to nitrite and then to nitrate. The nitrification process is accomplished primarily by two groups of autotrophic nitrifying bacteria that can build organic molecules by using energy obtained from inorganic sources––in this case, ammonia or nitrite. Nitrosomonas is the most frequently identified genus associated with this step, although other genera, including Nitrosococcus and Nitrosospira, may be involved. The subgenera Nitrosolobus and Nitrosovibrio can also autotrophically oxidize ammonia. Nitrobacter is the genus most frequently associated with this second step, although other genera, such as Nitrospina, Nitrococcus, and Nitrospira, can also autotrophically oxidize nitrite. The organisms carrying out this process are called denitrifiers. In general, they are heterotrophic bacteria that metabolize readily biodegradable substrate under anoxic conditions using nitrate as the electron acceptor. If oxygen is available, these bacteria use it for metabolism before they use the nitrate. Therefore, dissolved oxygen concentrations must be minimized for the denitrification process to function properly. Oxygen is typically is minimized by avoiding aeration of the waste water and having a high concentration of BOD so that microorganisms use all the oxygen. In waste water treatment facilities the BOD of waste water is reduced in aeration tank & nitrification of Ammonia to nitrates is done. Sufficient oxygen is made available so that all Ammoniacal Nitrogen is converted to Nitrates. Then the waste water is recirculated back to an anoxic zone (for creating condition of High availability of BOD) before aeration zone. The anoxic zone is not aerated to restrict supply of oxygen. In the ion exchange system, nitrate ions bind to ion exchange resin and, in the process, displace chloride ions. The resin is contained within a pressure vessel and is periodically regenerated with a concentrated salt solution. The function is similar to Water softeners which remove Hardness from water in exchange for sodium. The frequency of regeneration depends upon the raw water quality. Special performance nitrate selective ion exchange resins are used to treat the water. The resins used to treat water are approved under the American National Standards Institute/National Sanitation Foundation (ANSI/NSF) standards for contact with potable water. If an ion exchange column is not regenerated frequently enough, the concentration of nitrate could spike to levels well above 10 mg/L, which is a public health concern. Potential for “dumping” of the nitrate from the column resulting in periodic high concentrations of nitrate in the finished water. Spent brine disposal can be difficult. Reverse Osmosis (RO) is a physical process in which contaminants are removed by applying direct pressure to raw water through a semi-permeable membrane allowing water to pass through while retaining most of the dissolved minerals. Reverse Osmosis has advantage of removing excessive TDS along with Nitrates making even sea water potable. Less chemical consumption compare to ion exchange. In the electrodialysis (ED) process, ions migrate through ion-selective semi permeable membrane as a result of electrically charged membrane surfaces. A positive electrode (cathode) and a negative electrode (anode) are used to charge the membrane surfaces and attract oppositely charged ions. 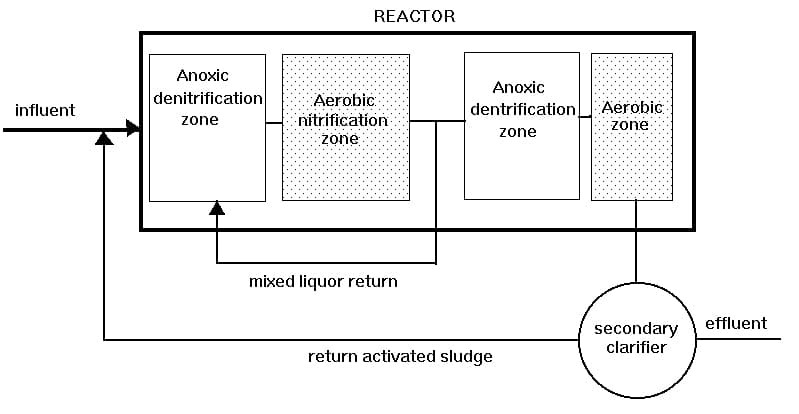 As a result of this process, ions such as nitrate are removed from the raw water. In electrodialysis reversal (EDR), the charge on the membranes is periodically reversed to minimize scale development. An electrodialysis reversal package plant is depicted below. High level of automation required. Suitable for low flow applications only. Biological denitrification is a process through which bacteria convert nitrate to nitrogen gas under anoxic (oxygen free) conditions. The nitrogen gas and bacteria are then removed from the water before entering the distribution system. Methanol is normally used as carbon source to facilitate the biological denitrification process. The major advantage of this system is it does not alter the composition of the water except removing the Nitrates. No change in composition of treated water. Extensive piloting may be required. Several weeks required from start-up to stable operation for new systems. Post treatment filtration and disinfection required. Post pH correction might be required. Costly continuous addition of Carbon source like Methanol. Media may wash out the bacterial growth during backwash period. may require post filtration for Suspended Solids removal.